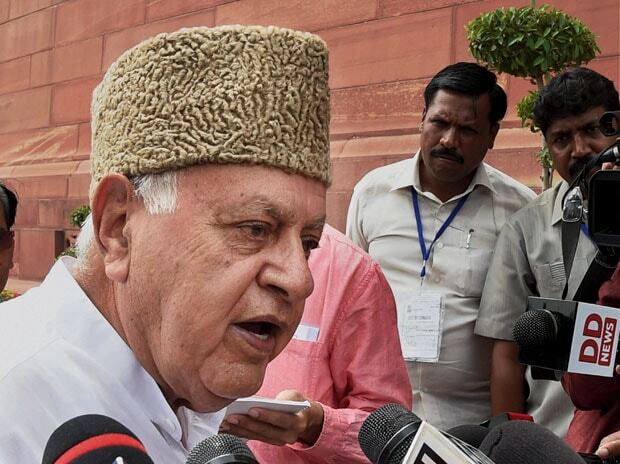 The Jammu and Kashmir National Conference will boycott the local body and panchayat elections in the state unless the Centre takes effective steps for protection of Article 35-A of the Constitution, which is facing legal challenge in the Supreme Court, party president Farooq Abdullah said Wednesday. "The core group (of NC) unanimously decided that the National Conference will not participate in these elections unless and until the government of India and the state government clarify their positions in this regard and take effective steps for protection of Article 35-A in and outside the courts," Abdullah said after the meeting here. He said the decision of the state administration to hold urban local body polls and panchayat elections was taken in a "hurried manner" and without taking into consideration the prevailing situation "created by the powers that be by unnecessarily fiddling with Article 35-A". Abdullah said the core group had a detailed discussion about the prevailing situation in the state with particular reference to Article 35-A of the Constitution. "It was felt that any tinkering with Article 35-A would prove disastrous not only for our state but for the entire country". He said the stands of the central government and the present dispensation in Jammu and Kashmir before the Supreme Court goes "clearly against the wishes and aspirations of the people of the state. "They conveniently ignore that this provision was incorporated in the Constitution after thorough discussion between the then state government and the Government of India and was made part of the Delhi Agreement 1952," he said. "It was also approved by the state's constituent assembly as envisaged under article 370 of the Constitution," he said. Abdullah said the core group resolved that J&K National Conference would fight tooth and nail all "sinister" attempts aimed at interfering with this constitutional guarantee. "Such attempts, if allowed, shall strike at the very basis of the relationship between the state and the Union," he said.